Ace parkway is a unique residential project among all other projects in Noida. 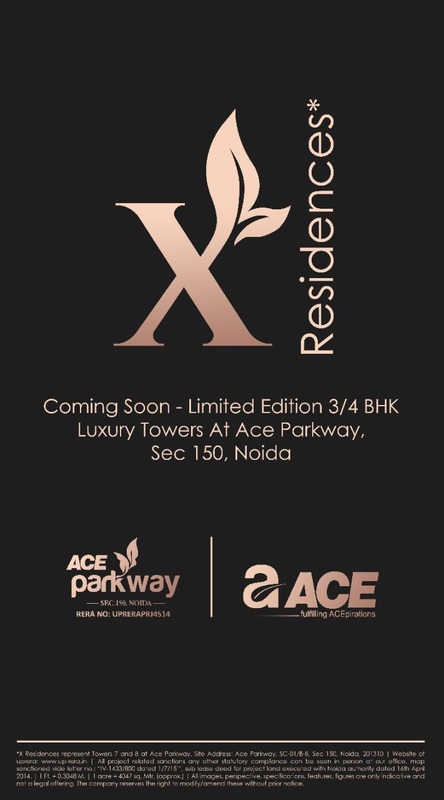 Ace parkway is being developed in sector - 150 Noida Expressway which is upcoming luxury sector for high-rise societies. This residential project is spread over 11.5 acres of land. The location of Ace parkway enhance the demand of the project because Ace parkway has three side open plot which gives openness within project and outside the project also. Ace parkway has only 11 towers which are aligned in such a way where maximum sun light and air can come inside every flat. Ace parkway is designed in such a way to make this residential project VASTU friendly. 51 sports facility for all age group people. Shaheed Bhagat singh park is adjacent to Ace parkway. Sector - 150 Noida is luxury vicinity NCR. The entire sector is full within different sports activities, like: Cricket play ground,Golf course, Football play gourd and many outdoor games. Ace parkway is opened from its three sides. Connecting road for FNG expressway. Walking distance from existing metro station. First sector if somebody is coming from Jewar Airport . Near to three different multi branded Malls - NPX mall, Ansal Plaza Mall and Omaxe connaught place. Walking distance from Metro station. Near to Pari chowk where all kinds of transportations are available. Ace group has become one of the finest developer for group housing projects. Ace group has committed for best quality of construction and on time delivery. Ace group has residential projects in Noida, Greater Noida and Noida Extension. This developer has enough experience for developing a society. Ace group maintains financial discipline with its every project. Ace group is becoming one of the iconic developer in NCR. Since 2010, ACE Group India has been in the real estate and is founded on the profound principle of Innovation, Creative, Quality, Perfection, Reliability, Sustainability.